Delighted to have this opportunity to tell you why we set up Brown Bin Rescue. From July 1st 2016 the Brown bin will become a new and central part of many household’s waste segregation throughout Ireland. Designed to take all Food Waste both cooked and raw, it can greatly reduce a household’s refuse collection costs. As a family of 4 with our 2 daughters now in their early 20’s we have used our Brown bin since it was first introduced in 2004 in Fingal where we live. It has saved us a considerable amount of money over those years with us only presenting our Black bin for collection 4 or 5 times a year. Our typical 6 monthly bill from Panda waste on that basis comes in at just €70.00, we have neighbours who spend circa €150+ over the same period preferring to use their Black bin. It was not without its challenges using the Brown bin initially, with my wife Gemma simply refusing to go anywhere near it due to Flies, White Worms and often Sickening Odours especially on hot days. biz to get into. I had no intention of getting into the Brown bin compostable bag / liner biz, however having had to clean the sickening gunge out of our own Brown bin one day I swore never to use it again until I found some way of keeping the waste contained. The challenge became a welcome distraction from the pressures being unemployed brought to bear, and no great expectations of employment looming soon either. Long story short I found an Irish company Greensax that designed and distributed plant starch based liners into the then Atlantic Homecare. I bought some and tried them and they were brilliant and my wife Gemma was finally able to deposit food waste into the Brown bin without her stomach retching on lifting the lid. Set up a trial arrangement with Greensax and I sold the products them with some success door to door and then transitioned to a website and online sales. 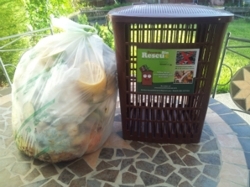 We quickly realised that food waste loosely deposited into our Brown bin became a nasty breeding ground for Flies and Maggots again, but at least they were contained in the bag in the bin. Stumbling on, trialling and then importing the Aerated Caddy from Italy cured all of the above. Collecting the food waste in our kitchen in a caddy that allowed the waste to breathe while creating no odours, then sealing it closed with the ears on the Greensax 13 litre bag was such a simple and effective system. Nova-Q were next to come on board with their incredible natural ‘Enviro-Chem ex’ odour eradicator. It was not a perfume it simply enlarged the size of the molecules that hung over food waste and locked the odours in. 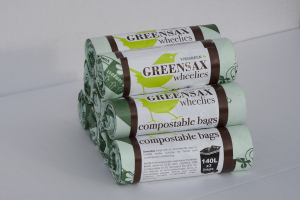 Most recent in 2014 Earth 2 Earth another Irish commercial compostable bag and general bag supplier to business only, asked if we would trial and sell their products to households too. E2E had designed and introduced a new material that made their compostable bags unique. Their bags could take up to 20kg in weight and would not burst when independently drop tested. Some 5 years on since we first found the solution to our own Brown bin problems, and thought of all the other households that had to be suffering the same issues, we are now thankfully growing busier every day. We owe our success to trialling the products ourselves in our own home and then endorsing them so that others could see our success with our Brown bin. Making these products available in annual quantities from both domestic and commercial suppliers, providing them at low cost while giving free delivery to anywhere in Ireland and the UK has also distinguished us from Supermarkets, Amazon and E-bay etc. Our customers like being able to call us for advice even asking for samples to be sent, so as to ensure when they purchase products from us it’s exactly what they need. This is our story and we look forward to continuing to supply households in Ireland and UK with the most suitable products and advice so that they can manage their Brown bin with ease. 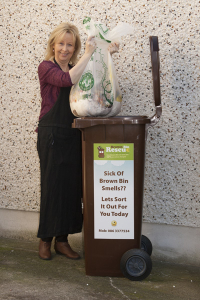 Brown Bin Rescue an Irish company provides you with Irish company products (with an Italian twist) that you require to manage your Brown Bin successfully, On Line, at low cost, and ensuring No Nasty Odors. As a family we test everything we sell ourselves at home first, and deliver this information to you via our web site, and social media sites enabling you to make well informed purchases. We are passionate about what we do and take great pleasure in knowing our efforts benefit you the householder and the environment. The European Parliament, Irish Government, EPA (Environmental Protection Agency), Local Councils and Industry professionals all agree that providing education on the Reduction of Food Waste production, and Diversion from landfill is paramount. The Brown bin and home composting play vital role’s in achieving that goal and in protecting our environment. I qualified as a commercial ‘Compost Facility Operator’ through Sligo IT and *Cré in January 2012, and by working with Compost facility managers was able to compile we believe to be the first really comprehensive list of what you can, and cannot put into the Brown bin. Together with video, photographic, and factual informative content our web site provides the education required to ensure the Brown Bin continues to be a success. Brown Bin Rescue and its products is the solution to a previously perceived environmental problem. 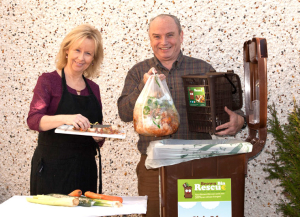 *Cré Is the National Composting Association of Ireland. DENIS LAWLOR Owner Brown Bin Rescue. Brown Bin Rescue markets an excellent range of products to service the needs of Irish householders and their Brown bins. All of the products have been fully researched, developed, and guaranteed by their manufacturers. Each company associated with Brown Bin Rescue has a link to their web site at the bottom of the page. 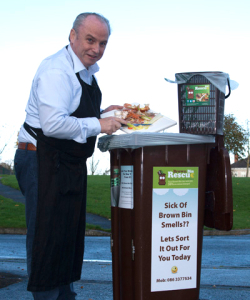 With the introduction of the Departments new household waste regulations those of us with Brown Bins, and households in new roll out areas will ultimately be responsible for the separation of Food Waste from general waste. Households using the products and services sourced by Brown Bin Rescue will handle this transition with ease, save on Black Bin costs, and be free from nasty odors. Placing responsibility on Householders to prove they use an authorised waste collection service or manage their waste in an environmentally acceptable manner. This will help combat illegal fly-tipping, littering and backyard burning of waste by a minority of households.